Marvel’s “Thor: The Dark World” continues the big-screen adventures of Thor, the Mighty Avenger, as he battles to save Earth and all the Nine Realms from a shadowy enemy that predates the universe itself. In the aftermath of Marvel’s “Thor” and “Marvel’s The Avengers,” Thor fights to restore order across the cosmos.but an ancient race led by the vengeful Malekith returns to plunge the universe back into darkness. Faced with an enemy that even Odin and Asgard cannot withstand, Thor must embark on his most perilous and personal journey yet, one that will reunite him with Jane Foster and force him to sacrifice everything to save us all. Having just watched a premier screening, I am delighted to come away from the cinema to write a positive review. 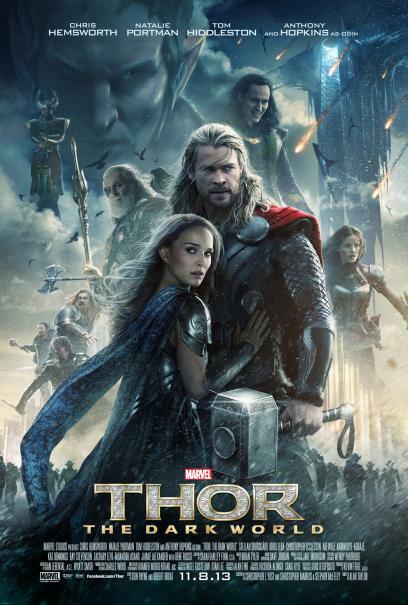 Thor Dark World is a spectacular special effect driven film, much of which is set in Asguard. I was worried that including Loki yet again might become a little repetitive, but in this film he excels as a great character, I only hope however that they don’t overdue his presence in the Marvel Universe. How many times can this guy come back from the dead? There isn’t as much character development as the first film, and Thor’s friends are nowhere near as interesting as the Avengers. I guess they simply needed these characters to all remain as they were so as to keep continuity within the Marvel universe, but its noticeable how little impact the storyline will have on anybody. The armies of Asguard were noticeably lacking in fire-power and weapons (even though they have an armoury), which is made even more evident when an entire guard division bring knives to a laser-gun fight. Their turrents were the only defense they had against an Ariel assault and proved to be practically useless. You would expect them to be better prepared. The healing powers of Thor, Jane, and even a smashed alien space-craft become a bit of a running joke as well. But at least they get hurt, even if it only takes them a scene to heal. And if smashing every column holding up a building is still not enough to take it down I’m not sure what will be. Christopher Eccleston played a competent bad guy, although his intentions for what he was doing was still unclear as to why. Its simple to say he was insane and just wanted to kill everybody, but when a threat of that magnitude appears and planetary alignments are in effect, you expect half the Universe to show up and stop him or take advantage of the situation, or come looking to take the power for themselves. I also expected to see the entire army of Asguard come to help out at the end like they apparently did in the past. Not just Thor who appears there by mistake. The scientist with the miraculous plot saving devise is also a little hard fetch to take in, especially when he creates a remote control for cosmic anomalies. Along with Loki’s illusion power which also serves as a convenient plot-saving devise at times. I’m willing to overlook these but there’s no denying what they are. Overall its a good enjoyable superhero movie, which you will want to watch several times and is a decent entry into the Marvel Universe.